Sweden's Ingemar Stenmark maintained an unshakeable grip on the slalom and giant slalom disciplines for an astonishing ten-year period. Between the mid-1970s and the mid-1980s, the Swede won no less than 86 world cup races (including two which earned him Olympic gold medals at the Lake Placid Games in 1980), a feat which has never been approached, let alone equalled. The Swede also won the overall world cup title three times, notching up 16 world cup titles in the slalom and giant slalom events. Born in Tarnaby, less than 200km from the Arctic Circle, Stenmark began winning local tournaments early and when he was just 13 was spotted by the eagle eye of coach Hermann Nogler. By the time he was 18 he had his first international title under his belt and his future prospects looked almost limitless. 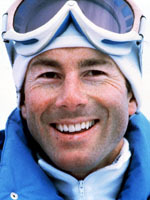 The following year, although only 2nd in the final overall world cup standings in 1975, he won both the individual slalom and giant slalom titles. He raced to three consecutive overall world cup titles in 1976, 1977 and 1978. In 1978 he crowned a brilliant season with a double triumph - in the slalom and giant slalom - at the world championships at Garmisch-Partenkirchen. Two years later at the Winter Games in Lake Placid, Stenmark achieved another landmark when he swept away memories of his disappointing performance four years earlier by winning the slalom and giant slalom. Success in the downhill, meanwhile, eluded him totally, and his tilt at the most glamorous prize of all at Lake Placid in 1980 went awry when he was injured in a fall during a training run. With the rise of the talented American brothers Phil and Steve Mahre, Stenmark's superiority began to waver and although he won the slalom at the world championships in 1982 his hold on the world cup circuit was finally wrestled from him. Although the great Swede remained at the very top of his sport for another two years he officially retired in 1989 after winning his last race at Aspen in Colorado. The new generation, that included wonderful skiers like Alberto Tomba, Markus Wasmeier and Franck Piccard applauded...Stenmark, with characteristic modesty, closed a monumental chapter in skiing history with a brief wave. In December 2004, he escaped death in Thailand where he was on holiday, just avoiding the momumental tsunami that hit South Asia.